On first listen, Lou Rebecca's debut EP sounds like an unabashedly pop-centric record: all vintage synth leads, bass sequences and obvious digital drum machines. Closer listening reveals more layers, however, and while it is no doubt intended to be pop music, there is an additional, subversive depth to the sound that cannot usually be expected from music that so heavily hinges on memorable hooks and melodies. Part of this added depth may be the role that Parisian by way of Austin, Texas artist plays in her music. Rather than just singing (which she does exceptionally well in both English and her native French), she also plays most of the instruments, writes all of the songs, and even arranges her own video choreography. It is this hands-on attention to detail that can take the synthy, 1980s pop throwback "Tonight" into more complex realms of weird electronics and tinges of experimental sound lurking just beneath the uptempo veneer. The lengthier "Neverending" also demonstrates more of Rebecca's diverse repertoire. With a piano lead, she blends in some excellent synth sounds and catchy drum programming, but as a whole the mix is kept open and sparse, letting all of the instruments, as well as her vocals, breathe and establish their own space. Switching vocals between French and English, the song builds to bigger, more complex and dramatic sequences leading to its conclusion. Space is also utilized expertly on "Fantôme." Lead by a simple but memorable music box like melody, she delivers her beautiful vocals in French, with added electronic and synth accents to it, giving a great sense of depth from a stripped-down arrangement. "If You Can" even features a bit of saxophone courtesy of Sarah Malika Boudissa, cementing its 1980s pop credibility but, again, careful production and nuanced arrangement give it a sense of subtlety that could otherwise be lost. 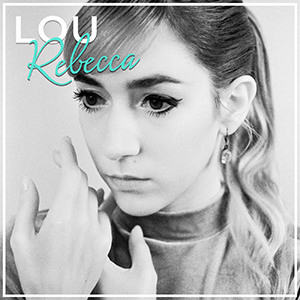 Given its shamelessly pop leanings, Lou Rebecca's debut may not appeal to the synth folks who like their songs dour and depressing, but there is much more here than meets the eye. Sure it is full of memorable choruses and catchy melodies, but its strength lies in its production and attention to detail. Even as someone who normally is not into music this light and upbeat, I found a lot to enjoy.